You can configure and turn on buyer notification email for each of these phases in the Account Settings. The configuration section shows 5 switches for 5 different order processing phases. Turning them on or off configures whether this email notification will be sent to the buyer or not. Although we provide a very basic email template for each phase, we recommend you update them – eg. make them more personalized, add you shop name etc. 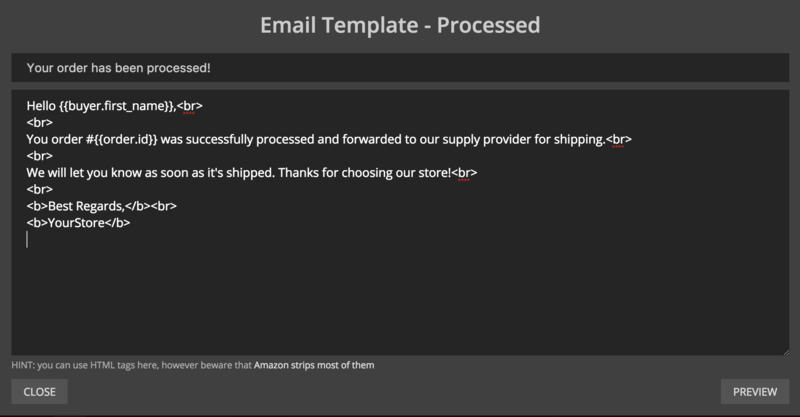 Use simple HTML tags to format your email – see allowed HTML tags for Amazon buyer messages. Click Preview button to preview your email before you save the template. Make sure it looks well. Don’t forget to click Save Changes on account Settings after you finish editing the template and click Close on the Template Editor popup. It shows which status emails were sent and when, which are scheduled, and you can also view the sent emails.